Gracing the Dawn has finally arrived after being sniffed and sampled by hundreds at the San Diego Comic Con. Exclusively at the E-shop for the moment, you will find the .25 gram and 1 gram glass vials. The flacon size with signature pouch will be added shortly. This fragrance begs to be sampled on the skin. 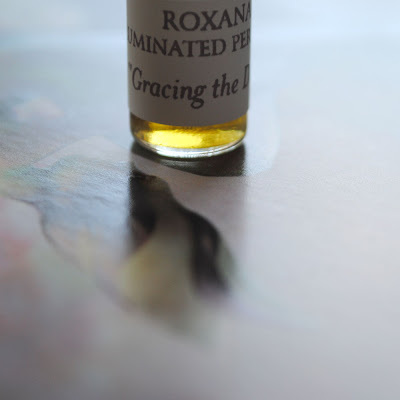 The aromatic experience via a scent strip or from the glass bottle stopper is very different than when inhaled on human epidermis, especially if you are keen on the subtle violet notes. Gracing the Dawn is a floral chypre natural botanical perfume featuring a bouquet of some of the most expensive aromatics found on planet Earth. The fragrance and inspired image is called Gracing the Dawn, a reference to the Three Graces from Greek mythology. Fantastical butterflies sit on the bough of a tree with freshly opened blossoms just as the first light of dawn illuminates the sky. The perfume is velvety and sultry evoking a vintage from days long gone or perhaps an alternate dimension where we glimpse luminous winged sprites on a wet, black bough. A myriad of exotic essences are artfully woven in this composition including Cestrum nocturnum, Night Queen, from South India. The main notes in this botanical medley include violet, mimosa, wood, and Italian bergamot. Read more about the composition of the fragrance at this link here at the journal. The beautiful crochet pouch has been skillfully handmade by my very talented mother Martha. When I am finally ready to debut a perfume we collaborate on the color and style of the pouch. 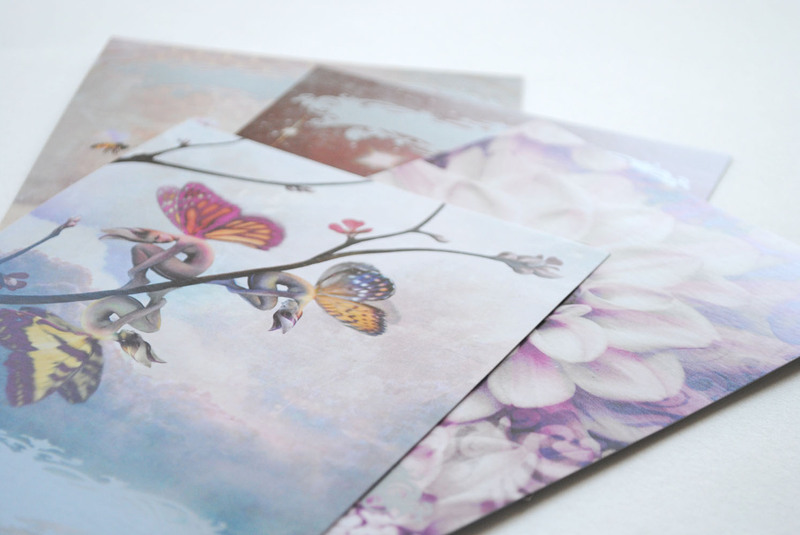 I feel very fortunate to have these beauties that compliment the intricate, handmade aesthetic that I bring to you. For Gracing the Dawn Martha created two small violet flowers. 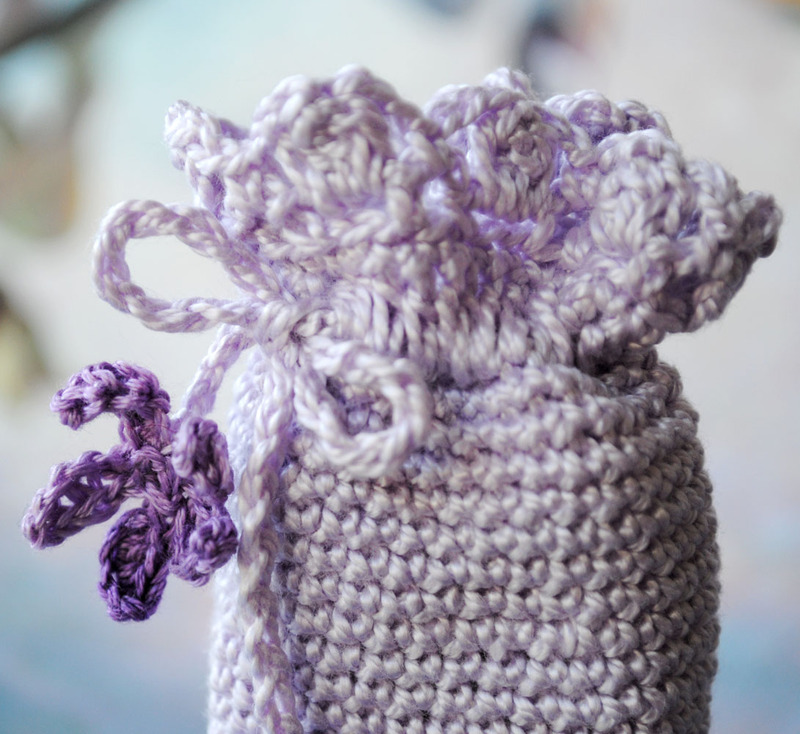 Like nature, each pouch is unique and features the violets in different shades of purple. The perfume is part of a series titled Flowers of Fortune associated with artwork by my award winning husband Greg Spalenka. Artwork and image debuted at the 2010 San Diego Comic Con. The postcards and posters will be available at Greg's E-shop and a dedicated website shortly. 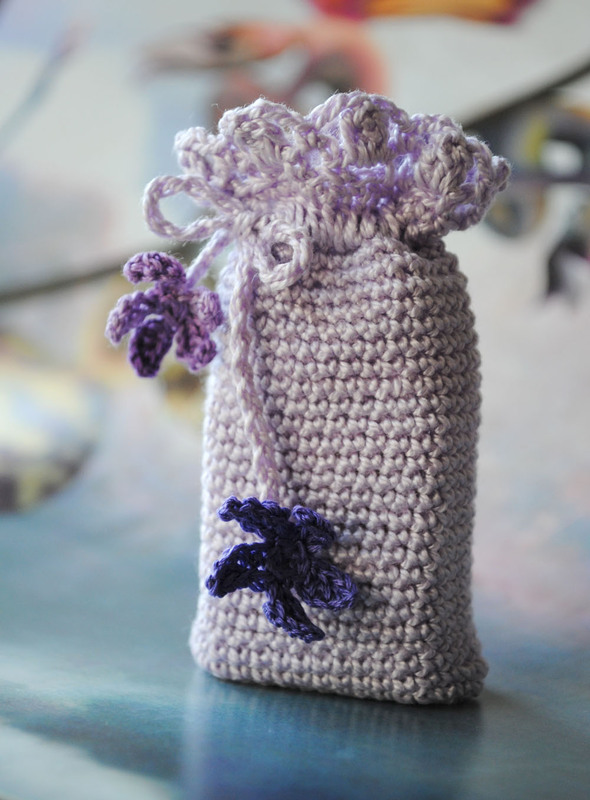 Images: Photos of perfume and pouch by me, Roxana Villa. Butterfly images ©Greg Spalenka. What a beautiful presentation ! Brizel, thank you so much, it is truly a gift to be surrounded by creative individuals! Everything is so lovely! Thank you for sharing with us! 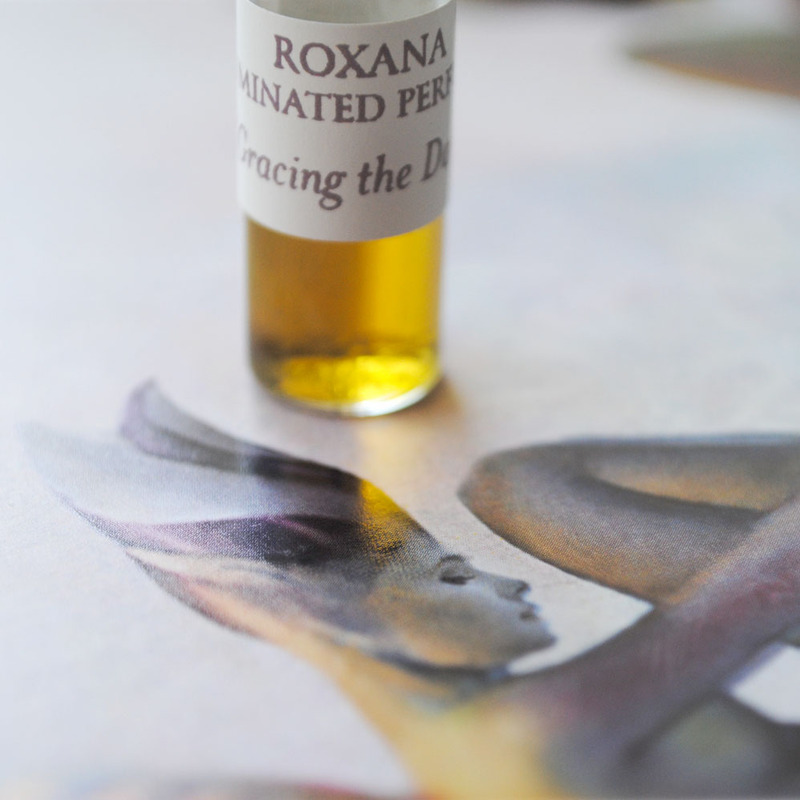 Have you ever thought about teaching a natural perfume class? Thank you Marmee. I am in the process of developing a class...actually have been for eight years now!